Nigel Mansell is planning to compete in the Le Mans 24-Hour Race for the first time this June at the age of 56. 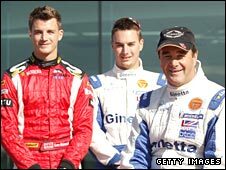 The 1992 Formula 1 champion has gone into partnership with Beechdean Motorsport and will drive a Ginetta-Zytek Z09R with sons Greg and Leo. He is also aiming to join his sons for September's Silverstone 1,000km race. "I will be racing with Leo and Greg during the season and if we receive an entry we will also be at Le Mans as a father and sons team," said Mansell. "I am very excited about 2010 and the prospect of racing with both my sons for the first time." Buckinghamshire-based Beechdean, with full factory support from Derbyshire's Zytek, will also run a Le Mans prototype for the Mansell siblings in the 2010 Le Mans Series. Beechdean team principal Andrew Howard added: "It's a dream come true for our young team to enter into a partnership with one of the sport's most famous names in the first year at this level. "Nigel brings a huge wealth of knowledge and experience to the team, with Leo and Greg already established as accomplished race drivers in their own right." Mansell quit F1 after his 1992 championship triumph with Williams and turned to IndyCar racing in the United States, winning the title in his 1993 debut season. He returned to F1 for four grands prix with Williams the following year, winning in Australia, and raced twice for McLaren in 1995 before retiring after 187 races with 31 victories to his name. Leo, 25, has already competed in the Le Mans 24-Hour Race, taking part in a Ferrari for the Modena team in 2009.